Entry includes access to the first five levels of the stadium, the paddock, and the park. Ages 17 and under admitted free; you must be 18 or older to wager on the races or in the casino. Promotional value expires Sep 23, 2019. Refundable only within 24 hours of purchase. Limit 20/person. Redeem on day of event for a ticket at the venue box office. Merchant is issuer of tickets - discount reflects current ticket prices, which may change. ADA seating cannot be guaranteed; contact box office prior to purchase for availability. Ticket value includes all fees. Ages 17 and under admitted free; you must be 18 or older to wager on races or in the casino. Merchant is solely responsible to purchasers for the care and quality of the advertised goods and services. Offer is not eligible for our promo codes or other discounts. 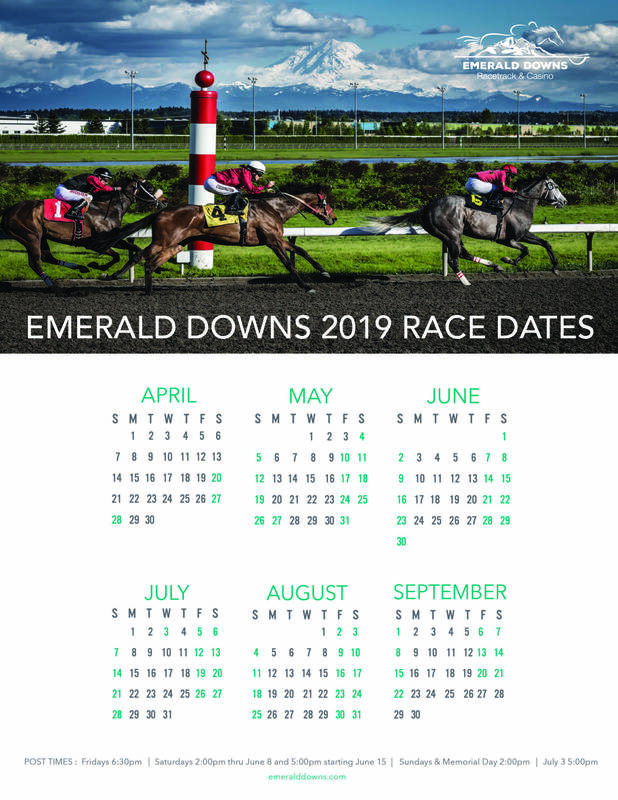 Throughout the spring and summer, the track at Emerald Downs rumbles beneath galloping hooves as four-legged athletes bolt toward glory in front of fans both young and old (kids under 17 enter free). During each race, jockeys clamor for position in the track standings, who, rather than retiring to quiet lives as local-newspaper oat critics, solidify their legacy in Emerald Downs lore by attempting to break the track's longstanding records. In addition to horse racing, there are plenty of other activities, like playing table games at the new casino. There are also frequent promotions and special events to energize the track's atmosphere. Popular events include Food Truck Festival, Corgi Races, Longacres Mile, and Italian Day. What's more, giveaways, family entertainment, and Fabulous Fridays with live music and beer specials provide a lively atmosphere for guests to eat, drink, and play. Contact Emerald Downs at (253) 288-7000 for questions or hours.